He had spent 15 years trying to prove himself a man on his own terms, independent of his dad. Dad had not made his high school graduation, his college graduation or his wedding. That was okay because he really did not want him there anyway – He did not need his dad. Then his daughter was born and he realized that in spite of his efforts to distance himself from the father-son relationship, they now had something in common – They were both dads. Click HERE to view this testimony of reconciliation. A son needs his father or a father-figure. Time gets by and wounds do not heal themselves. This is a call to dads and teenage sons – Commit a weekend NOW to each other at beautiful Frontier Camp. 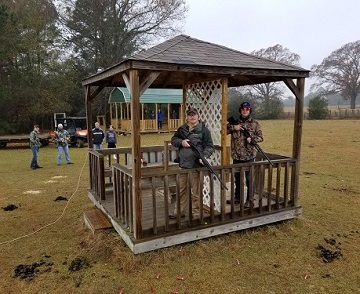 Commit to having fun shooting clays, climbing high ropes and engaging in a laser tag battle in the piney woods; commit to having mature father-son discussions around the adventure that is manhood; and commit to entering a new chapter of the father-son relationship. This is the Adventures for Life father-son weekend. Click HERE for info and to register. So Absalom had fled and gone to Geshur, and was there three years. The heart of King David longed to go out to Absalom ... Now Absalom lived two full years in Jerusalem and did not see the King’s face. – 2Samuel 13:38-39 & 14:28. David had allowed his son Absalom to return to Jerusalem after fleeing to Geshur three years earlier. David longed to have Absalom back but failed to reconnect with him for two years. Five years apart created quite a relational void for the son and the father. The rest of the story does not play out well for Absalom due in large part to the mighty warrior and king, David, being distant as a dad. Men can be successful on many fronts but if they are not intentional on the fathering front, the negative impact can have disastrous results. Sons need dads to invest the TIME to connect physically, emotionally and spiritually. A dad’s role is to lead by example and raise sons in a Biblical understanding of manhood. Faithful Fathering has two ‘open’ retreats this fall for dads with teenagers – the father-son Adventures for Life weekend November 30 – December 2nd; and a father-daughter Being There weekend December 28–30. Commit a weekend to invest quantity time that will yield quality results in relationship with your son or daughter. Click on faithfulfathering.org/connect1 and scroll down on that page to view these opportunities. Prayer guide: Father, thank You for Your word and Your patience with me. King David’s example seems extreme but between busy-ness in the world and divorce, physical, emotional or spiritual separation can exist for years. Relational voids develop and unhealthy relationships, addictions or other self-destructive behaviors result. I confess my sins and those of my father’s house. I spent too many years thinking I was a good dad but failed to realize how I fall short of Your call for me as a father. Forgive me Lord. You call me to be Your representative in family and be engaged in raising my son in the Biblical understanding of manhood. Help me be intentional in committing the quantity TIME needed to be the man, husband and father You call me to be. Amen. A faithful father raises his son in a Biblical understanding of manhood.